The devastating death of 11-year-old Ashlynne Mike who was murdered May 3, 2016, in Shiprock has shaken everyone in our state. It's been hard for our APD officers who investigate difficult crimes daily. 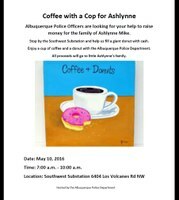 They decided they wanted to help her family, so a group of them are hosting a Coffee with a Cop fundraiser. The event is Tuesday, May 10th from 7 a.m. -10 a.m. 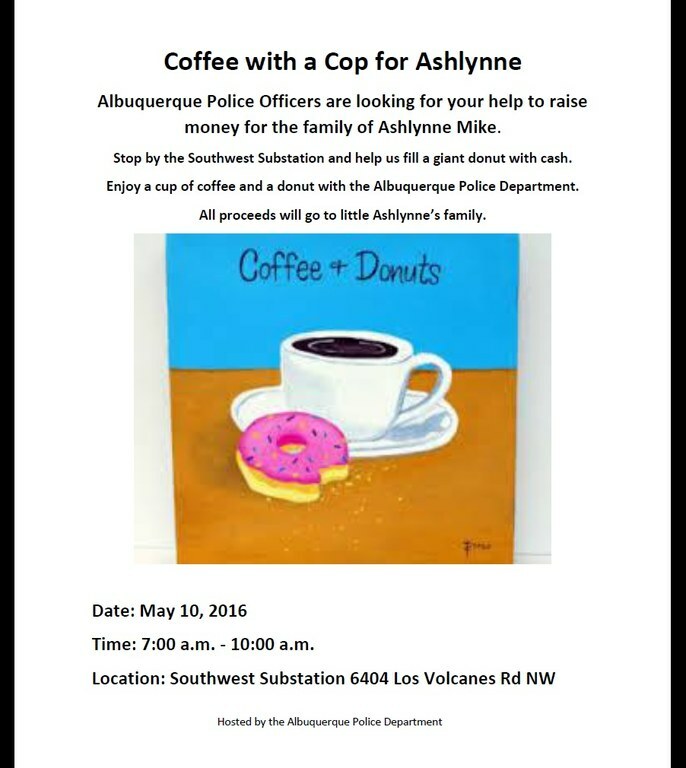 There will be FREE donuts and coffee, lots of APD officers to chat with, and we hope to fill a giant donut with donations to help support Ashlynne’s family. Everyone is welcome to attend. Anyone who would like to make a donation, but cannot come to the event is welcome to drop off a donation during business hours at the Southwest substation.